So, tomorrow night's Chuck is broadcast in INTRU3D - an updated version of the red-blue 3D that they used to do on television. Two weeks ago, when I first heard about it and saw a clip of the new 3D episode, I started getting worried - Tina and I both watch and enjoy Chuck, but if it was to be broadcast in 3D then it would be unwatchable without glasses. The people in the show all had green and yellow halos around them and even the short clip gave me a headache (I'm sure even with the glasses a full hour episode will give me a headache, but at least that's the intended experience!). They said the glasses would be available at Sobe LifeWater stands, so I kept my eyes open for them. After a week of not seeing these stands, I started getting a little worried. 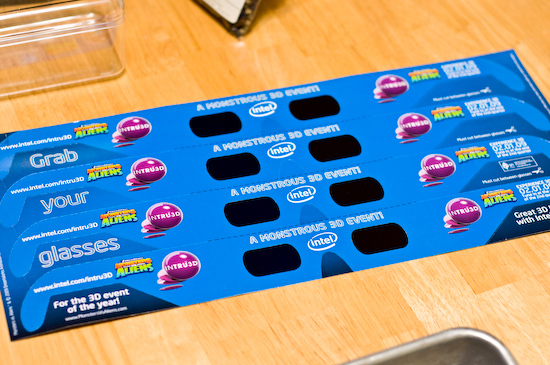 I went to several stores asking about them ("Do you guys have any Sobe LifeWater 3D Glasses for Chuck?") and the employees I asked at Safeway, Lucky, or SaveMart knew what I was talking about. Now with less than a week to go, I got even more anxious when I found out that Monsters vs. Aliens was doing a big 3D commercial during the Super Bowl and used the same glasses. I went to 1 Target, 2 Walgreens, 1 SaveMarts, 2 Luckys, 3 Safeways, 2 Longs Drugs, 1 RiteAid, 4 7-Elevens, and a few other smaller stores to see if anyone had any. It wasn't until today, Sunday, that I found any stores that actually had some - Target, Safeway, Lucky, and SaveMart had received some doing the last few days and were all out. So, my problem was that I went too early looking for the glasses and didn't ask the right people (they never set up a display like they were saying on TV - only a visit to Customer Service got me any employees that knew about the glasses). Once I figured out where stores had received any glasses at all, I went back to revisit the stores that I had gone to in the last couple weeks. None of the Safeways or SaveMarts had them, but the Lucky at Lawrence Expressway and El Camino did have them hidden away at the Customer Service desk. They had received their first delivery on Saturday, ran out in a matter of hours, and received another delivery on Sunday morning. What a pain. So, I get over this website user interface design faux pas, look to the left to find that nothing has changed - it didn't take me to the contact page. I look to the right and find a list of help sites for various Microsoft products. Some how, logging into the XBox Live page and doing the password reset has taken me to all of Microsoft's account stuff instead. The XBox help instructions tell me to access the contact support from the Xbox Live Accounts and Billing Page. 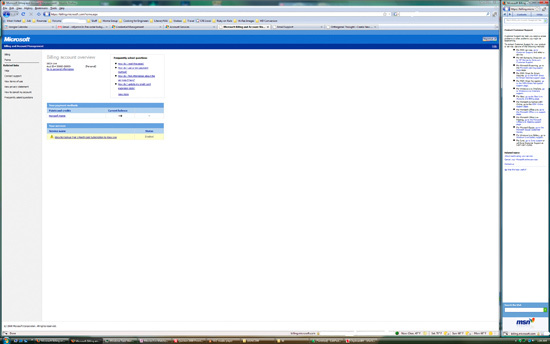 So, I click on it (resize my windows so they are not ridiculous anymore) and try to find the page I'm looking for. I don't see it immediately, but I find a Support page where there is an "Email Support". (There was also telephone support, but it was too late to call.) I click on email support and there is a nice sane looking contact form. I'm guessing I could have gotten to this form without hijacking this guy's XBox account, but who knew? Friday night, we wet out running some errands and Tina realized that there was something at Macy's she wanted to look for. It was 9:00pm, and we were in the Mountain View Best Buy (looking for Civilization Revolution (PS3) which, by the way, Best Buy no longer carries). Tina's Google Maps on her phone was acting up and couldn't get the telephone number of the Macy's in Sunnyvale and looked a little worried so I asked her what the problem was. She said Google Maps on her Palm Centro wasn't working properly and I poked around on it a little and couldn't get it to find the Macy's closest to us. I was about to pull out my phone and do a search when I asked why she needed the Macy's location when we knew very well where it was. She said she wanted Macy's telephone number and I said, "Duh, why didn't you ask me???" (For the last five years our home phone number has been just one digit off from Macy's so for about 50% of the calls we receive it's actually for Macy's and I try to provide the number to those callers - unfortunately for them, they usually hang up without saying anything.) I told her the number to call (which is actually the number to Macy's at Valley Fair) and we found out they were to close at 9:30. I said, no problem, we could get to the Macy's in Sunnyvale Town Center with plenty of time to spare. I drive over and we walk up to the door and look at the store hours posted there. Yep, they have special holiday hours and they close at 9:30 instead of the usual 9:00pm. Fifteen minutes would be plenty since Tina knew what she wanted to look at. In we went and got about 10 yards into the store when I realized that the few employees behind the counter and near that entrance were staring at us. My brain kicked in and I rewound the conversations I heard while walking into the store - the employees had been talking about what time it was and something about closing. One of the employees said to us, "We're closed!" I said, "No, it's not yet 9:30." Yesterday, Tina and I went to the Yahoo! Holiday Party at the San Mateo Convention Center. Like previous years, the Party took place in two of the convention center halls. This year the second hall had different food from the main hall which included sausages and mini-burgers. I made myself a little burger with a beef patty and shiitake mushroom. I took a couple bites, savoring the flavor of the mushroom with the light char of the beef - the surprisingly soft and tender beef. 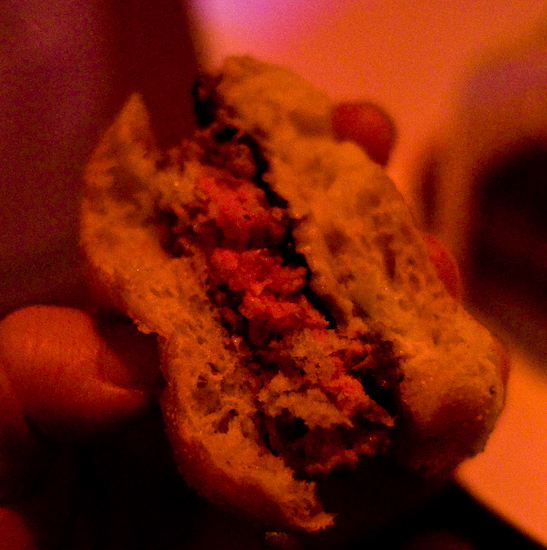 I took another bite and thought that the burger tasted really good but the texture was off - I like flesh that's soft, but it should also be firm and provide some resistance when chewed. This hamburger was just soft. I looked down and all I saw was a dim red burger in my hand. This last election in California has been quite interesting and there's been much hoopla made about the presidential race and the results in various states including California. I'm not going to talk about any of that. I want to point out a state proposition that was on the ballot and was a fairly useful indicator of, what I think is, a major problem with our voters. "Why aren't you smarter? [drumstick!]" So, I've got the TV on while I'm working on my computer and Blade: Trinity comes on TNT (a basic cable station). The opening sequence involves a lot of violence and action where Blade (Wesley Snipes) kills a bunch of vampires and then stakes a human (non-vampire). He asks, "I staked you with silver, why aren't you dead?" and the guy gasps, "Why aren't you smarter?" and then in a COMPLETELY different voice, "Drumstick!". Obviously, TNT felt it necessary to dub over whatever obscenity was originally there, but who came up with the idea to say "Drumstick"?!? Of all the words they could have chosen to fill that spot, "drumstick"? One thing that I really hate is when I'm left alone WAY too long at a restaurant. When a waiter doesn't come by for a while after we've been seated, it's really frustrating. This evening, I kept trying to catch the eye of the waitress that was serving all the tables around us, but she was VERY adept at not looking in our direction. Finally, our waiter arrived (it wasn't the waitress that was serving all the other tables in our vicinity) took our orders and disappeared. Apparently, we were in the boondocks of this guy's waiting area and stuck in the middle of a different waitress's realm. They we realized that we were starting to get really cold (near an air conditioning vent). We kept looking around for our waiter but he didn't come back. Then a server (not our waiter) arrived with our food and we asked if it was possible to move. She said she'd find our waiter and disappeared. By the time the waiter returned, we had practically finished eating. Unfortunately, I didn't immediately ask for a to-go box so we once again had to wait and wait. I eventually stood up and walked around to look for our waiter. After returning to our booth, I stood there long enough for a passing waitress to ask if I needed anything. I asked for our check and she went off in search of our waiter. He returned shortly with our bill. I feel that restaurants, even casual ones, should do a better job with dividing up tables so they are accessible to their wait staff. 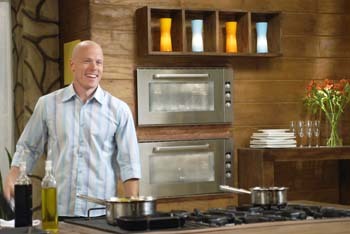 So, I've been watching (of and on) A Lyon in the Kitchen, a new cooking show on Discovery Health. I began watching because I received some promo material a few months ago and watched a few of the show clips and wrote up a brief article on Cooking For Engineers. His shows are nothing special when it comes to cooking shows, except for the fact that he spends about 45 seconds at the begining of each show visiting a source for one of his ingredients - a mushroom farm, cheese market, beet farm, etc. I had a real problem watching the Grilled Halibut and Provincial Bread Salsa episode. He starts off visiting an olive oil producer and the on screen tip tells us to eat olive oil because it contains "monosaturated" fat. Okay, it's just a typo, and it's probably someone else's fault they he's got "monosaturated" instead of "monounsaturated" on the screen. Then he come back to the kitchen to demonstrate how to make what he called a "Provincial" Bread Salsa. I'm thinking, what does he mean by "provincial"? Does he mean from a local or rural dish? Or does he mean provençal (which is of course spelled differently and pronounced differently - [PRO-von-sawl])? He then explains that the dish is an homage to the Provence-style of Italy. So, he does mean provençal. My next problem is that Provence is French! Maybe that's why his show is on Discovery Health… and that would also explain why no one caught these fairly big mistakes that occurred in the first five minutes of this show. For all the faults of Food Network, I think someone would have pointed out that this wasn't quite right. I think I can stop recording his show on my DVR. The New York Times reported today that the social security number of 30,000 people "who received loans or other financial assistance from two Agriculture Department programs were disclosed for years in a publicly available database, raising concerns about identity theft and other privacy violations". The first question that comes to mind, is why does this stuff keep happening? What's wrong with Chris Matthews? This week we were all shocked by the tragedy at Virginia Tech where Cho Seung-Hui gunned down and killed at least 33 people. 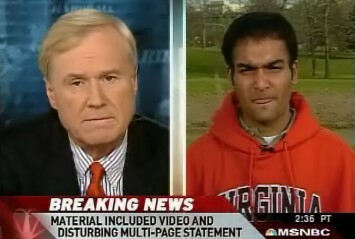 I don't really want to blog about the events or the manifesto or how crazy Cho Seung-Hui must have been - but I do want to talk about getting upset over an interview with Karan Grewal (Cho's "roommate") and Chris Matthews.